I was super excited to hear that Alex Gino had a new book coming out. I enjoyed George and with the societal issues that were to be tackled in this novel, I couldn’t wait to read it. I received this ARC at BEA in exchange for an honest review. Jilly loves to read fantasy and connects with other kids just like her through a chat room. It is this online space where her true friends really reside, this is also where she turns when she has difficulties in her life. Jilly has heard about the police shootings on tv, which has caused tensions in her extended family. This is especially true when her married aunts and their biracial child attend family gatherings, and racist comments are made. Things become especially challenging when the family finds out that Jilly’s baby sister is deaf. Together they try to navigate the deaf community and figure out whether or not they should get the cochlear implants for the baby. 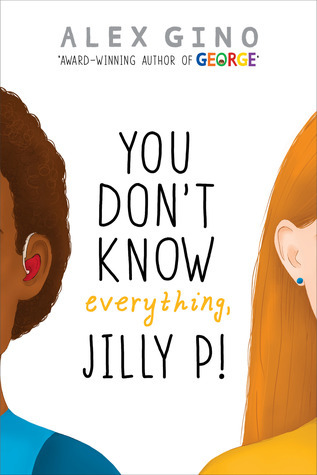 Jilly turns to her friend Derek online, who so happens to be African American and deaf. While she thinks that asking Derek about her problems is okay because that is his experience, she doesn’t realize the racist/discriminatory issues she is creating. Jilly is falling for Derek and she needs to check herself, before she loses the one guy she totally has a thing for. I enjoyed this book and thought that it brought great issues and layered them around the concept of microaggressions and contemporary racism. While many people believe that this work was heavy handed, as with George, I thought it was an important message. This book does fall more into telling the reader’s what to think, instead of showing them, but I still think it works.